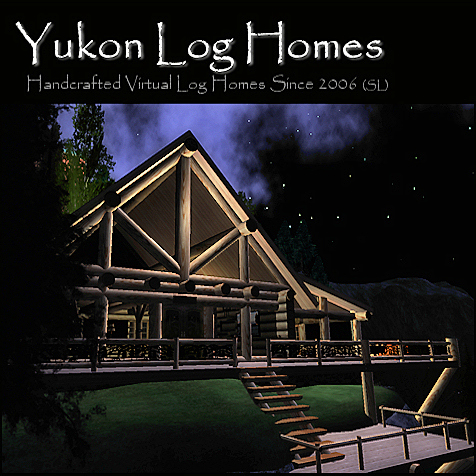 Handcrafted virtual log homes and cabins. It is our primary goal to reproduce the authentic look and feel of log homes and log cabins in many of the virtual grids at a reasonable cost to our clients. As the owner of Yukon Log Homes, I am committed to making your log home purchase and setup a truly pleasant experience. Whether your log cabin will cling to a snowy ski slope or nestle in the woods, we just may have what you are looking for at Yukon Log Homes. Be surrounded by the look of pine and the natural beauty of wood textures. We incorporate both real prim logs and log textures into our homes with aesthetically pleasing details. Soaring cathedral ceilings, walls of glass, intricately carved wooden doors, sprawling decks and many other features. We work to create a quality product, so you can “log-in” to enjoy and relax in the beauty & warmth of your Yukon Log Home. Every year we have people contact us about buying our homes to use in “real-life”. Please note that these are virtual log homes and cabins, and although we too would like to live in one of our cabins, they aren’t “real”.